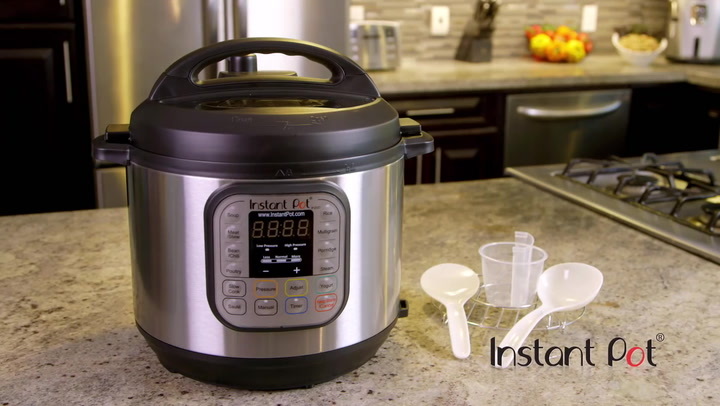 The Instant Pot Duo is the world's bestselling multi-cooker that combines seven kitchen appliances in one. It’s a pressure cooker, slow cooker, rice maker, steamer, sauté pan, food warmer, and yoghurt maker in one appliance. The advanced microprocessor technology and built-in sensors control a range of 14 smart cooking programs for perfect results in a fraction of the time. It saves time and space in your kitchen, locks in more nutrients and cuts down on energy costs. This product comes with a 1 year guarantee (for home use only). View more from Gifts for The Home Chef, Electric Pressure Cookers, Rice Cookers, Slow Cookers, Smart Multi Cookers, Instant Pot. I was really excited to try out this nifty appliance and see if it lived up to the hype. The answer is YES - it's compact, easy to use, and has many different cooking options to choose from. I chose to make the Instant Pot cheesecake recipe just to try something different, and it did not disappoint. It was straightforward to prepare and make. As a newbie to pressure cooking, I thought it would be daunting but the user manual helped a lot. A wonder in the kitchen! I dumped my crock pot, yoghurt maker and pressure cooker so there’s so much more room in the cupboards. Work lunches have become easier, weekend prepping a dream, and even my husband is eating more vegan food and loving it! Have cooked more in the Instant Pot in the last week than my pressure cooker that I’ve had for years. Excellent investment and taking it camping next week! This really is a versatile and speedy cooking machine. I'm still getting used to using it and exploring the various cooking options, but am finding it easy to figure out as I go along and the instruction manual isn't overly complicated. I recently tried a beef bourguignon recipe from the Instant Pot website and it took 23 minutes to pressure cook - a lot quicker than the dish's standard 4 to 6 hour cooking time. The meat was perfectly tender and falling apart, and the sauce/gravy was really tasty. The one thing to note is that the capacity is 6 litres but if you are cooking dry ingredients or ingredients that may expand, you can only fill the inner pot halfway. Also, if you are pressure cooking, you can't fill it more than two thirds of the way. The pot does have measurement markings inside, which I find a helpful guideline to prevent overfilling it. I'm looking forward to trying the other cooking programs, especially the yoghurt making and rice cooking options!